Plucked from tropical America, the pineapple was brought to European tables and hothouses before it was conveyed back to the tropics, where it came to dominate U.S. and world markets. Pineapple Culture is a dazzling history of the world's tropical and temperate zones told through the pineapple's illustrative career. 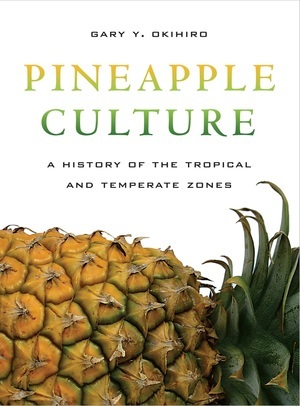 Following Gary Y. Okihiro's enthusiastically received Island World: A History of Hawai`i and the United States, Pineapple Culture continues to upend conventional ideas about history, space, and time with its provocative vision. At the center of the story is the thoroughly modern tale of Dole's "Hawaiian" pineapple, which, from its island periphery, infiltrated the white, middle-class homes of the continental United States. The transit of the pineapple brilliantly illuminates the history and geography of empires—their creations and accumulations; the circuits of knowledge, capital, labor, goods, and the cultures that characterize them; and their assumed power to name, classify, and rule over alien lands, peoples, and resources. Gary Y. Okihiro is Professor of International and Public Affairs and Founding Director of the Center for the Study of Ethnicity and Race at Columbia University. Among his books are Island World: A History of Hawai'i and the United States (UC Press) and Common Ground: Reimagining American History.